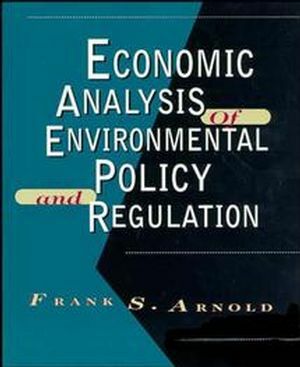 Frank S. Arnold is the author of Economic Analysis of Environmental Policy and Regulation, published by Wiley. Purpose, Technical Level, and Scope. Environmental Policy Analysis in Practice. Design of Appropriate Models for Policy Analysis. Reconciling Conceptual Tools and Available Data. Modeling and Interpreting Social Welfare Changes. The Analytical Significance of Baselines. The Importance of Anticipatory Responses. Recent Trends in Environmental Policy: Some Cautionary Notes. Environmental Policy in Theory and Practice.